The inaugural Equinox half marathon was a blast. Every fledgling race has growing pains, and this one certainly had a few kinks, but overall the organization was flawless even with the logistical nightmare that comes with a point to point course. The buses that transported us from the parking area left on time. The drive was long, 45 minutes, as the pickup was 10 miles from the finish area due to lack of parking at the finish site. But, the bus was comfortably warm, even bordering on cozy. I cranked my iPod and watched from the window as we drove the course in reverse. 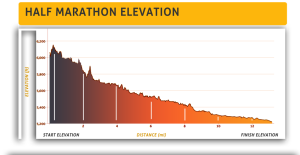 The impetus for choosing this particular race was the downhill course profile. As one friend suggested, I could tuck and roll my way from the start to the finish. 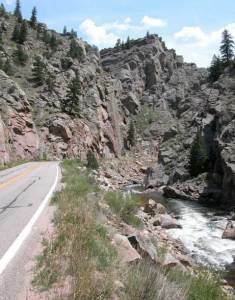 I love downhill running and as we drove up Poudre Canyon (pronounced Pooter, not as it looks, as I was politely corrected) I came to fully appreciate how much downhill this course offered. Unfortunately, the first half of the course is markedly steeper and faster than the second half, lulling me into a false sense of my capabilities on the day. I won’t lie, when the gun went off, I went out like a caged tiger. Perhaps it was the excitement of racing again after a long layoff. Perhaps it was consistently faster workouts. Perhaps it was renewed confidence from putting to rest a long term injury. Perhaps it was just plain stupidity. Anyway you look at it, I had no business running the first 10k in 36:34. I haven’t run an open 10k that fast in quite some time, so my legs were not prepared for that kind of beating. I reasoned that eventually I would like to run an entire 13.1 miles at that pace and I had to start somewhere. I paid the price big time. Not only was the back half of the course less drastically downhill, but the wind shifted from a nice tail wind to a menacing headwind. My legs ached, my lungs burned, I tried my best to hold it together despite the protestations from my body. I embraced every moan and groan. It was a delight compared to the things I endured before I had surgery. This time, the discomfort was in my control. I could ease off the throttle and make the hurt stop if I so decided, which, of course, I didn’t. I crossed the line in second with a time of 1:19.22. Diesel the Dog was so excited to see me when I crossed the line you would’ve thought I was gone on a 6 month expedition, not a 13.1 mile jaunt. In terms of improving the race? More aid stations that are better equipped. Over the 4 aid stations on the course, I ended up with 2.5 sips of water. Each was filled with thimble full of water and the mouth of the cup was so wide that when I tipped the cup back to sip the drops of water more of it ended up on my face rather than in my mouth. At one aid station I tried to grab two cups, but the volunteer seemed startled by my presence she just dropped it on the ground. I was so dehydrated after the race that I didn’t pee until 4 hours after I finished and that was after pounding water, Izze , V8 (an IV drip in a can) and my favorite post-race recovery drink, coffee. The course itself was a delight. Poudre Canyon is interesting, with a flowing river and magnificent rock formations. The damage from the fires earlier this year was evident all along the course, with huge patches of charred ground interspersed into areas that were untouched. The most important aspect of this race was validating what I already knew from training: my rib is better. Despite the continued positive feedback I received on a consistent basis from training and daily living, I was not going to know for certain that the surgery worked until I pushed myself in a race. For the first time in 3 years, I raced without fear, unburdened by an injury that tried to own me. What a relief. I haven’t been in may races but I have to admit that management is quite important to succeed for everybody. It can be a great route but it can be screwed by the management. Next story Stand by your man? Not this time.